Once more we in the Republic of Ireland are looking over the hedge at our neighbours in the United Kingdom. In 2014, it was the possibility that the UK could be shorn of Scotland. Now the question before all of the British people is whether or not that polity remains within the European Union. The other parts of the UK were powerless as they observed the people of Scotland debate it out during IndyRef. Now we in Ireland look on equally impotent as the UK as a whole have their own IndyRef. Brexit could bring back a REAL frontier onto this island. That would represent a material change to the circumstances for the people of this state, especially the Border Region. I can attest that living in Donegal over the past twenty years that travel to the nearest part of the UK has become increasingly hassle free. The border, in many ways, has all but disappeared. There was a point when it was thought that the UK would join the Euro, but Gordon Brown; the then Chancellor held firm. Despite the UK remaining with Sterling cities like Derry have essentially become dual currency zones. This is especially noticeable when the Euro is strong. The leave side in the Brexit debate are, in part, characterised in Britain as Little England UKIP voters. A recent poll put the people of Northern Ireland as being 75% in favour of the UK remaining within the EU. However, the wishes of those within the Six Counties will matter little given the demographic realities. This, indeed, is the price of the Union. The idea of Britain once more striding the world stage strong independent and proud is a heady concoction for many in the Protestant Unionist Loyalist (PUL) community. It is these folk who reacted with rage at the decision of Belfast City Council in December 2014 to fly the union flag only on 17 designated days at the city hall. The DUP have come out on the exit side and this is entirely in keeping with their ideology. British Imperialist exceptionalism was compromised by joining the supranational body that morphed in the European Union. For those who define themselves by loyalty to the London based state the partial transfer of sovereignty to the EU structures has been increasingly hard to take. Here in Ireland, this island has peace and stability because, in part, both jurisdictions are within the EU. 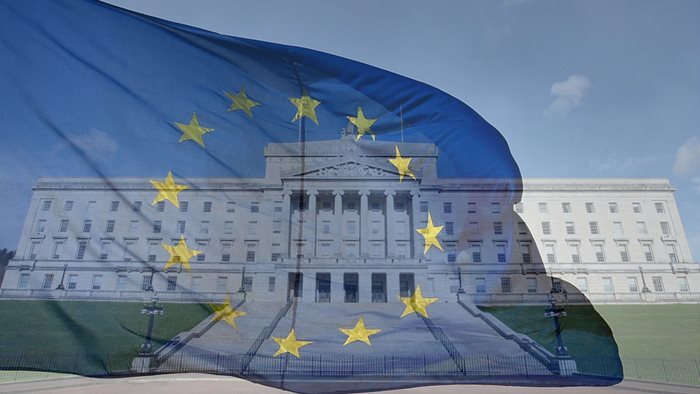 Once the Good Friday Agreement was ratified by all of the people on this island in simultaneous referenda, the EU stepped up and paid up. The “peace money” was a sort of Marshall Plan to heal the socio-economic wounds of the Northern conflict. If the Brexit Brigade complains about the subventions that flow from the British exchequer to Brussels that cannot be stated in Northern Ireland. EU funding sustained many community projects within the Six Counties and the entire Border Region. If Irish re-unification were to be agreed at some point in this century, then the role of Brussels and Strasbourg would be vital. There is nothing that the PUL community would love more than for the blurry border at the Lifford Bridge to become once more a Checkpoint Billy. It is not a coincidence that one of the poorest parts of the 26 county state for generations was North Donegal. The natural hinterland of Derry City is the Inishowen Peninsula and the villages and townlands that stretch from the River Mourne to the mouth of the Swilly. Partition created an armed frontier out of parish boundaries and for most of the 20th century it consigned this part of the island to penury. Donegal is the only county in the Republic without any rail link and Northern Ireland’s trains do not cross the Foyle, but stop on the Waterside. The creation of the Border in 1922 was a material change in the circumstances for all of the people in the North West of this island. Moreover, it was imposed by a much more powerful outside entity. So once more we’re looking over the hedge to our neighbours and await their decision. Of course, we have no say in your verdict, but it will certainly impact on us if the UK heads for the door and abandons the European Project. Prime Minister Cameron will hope that he can sell the deal to his people. It is one where the UK remains a semi-detached member from the EU. In that, the vast majority of people in this state will will wish him well. These are conjoined islands and will remain so even if the UK leaves the European Union. In effect, it is the Schengen agreement for this archipelago that goes back to the formation of the Irish Free State. Taoiseach Enda Kenny, who is facing the Irish electorate in a General Election this Friday, stated that Brexit would have a negative impact on the Peace Process. Despite the hostile posturing of many Ulster Unionist politicians apropos their neighbouring state the Republic of Ireland is Northern Ireland’s largest export market. Throwing up a tariff barrier between Donegal and Tyrone would probably hurt everyone here, but it might make the Flag protesters in Belfast feel that wee bit more British. The role of the Westminster state in our affairs dominated politics on this island for centuries. Now, it would appear, many people in England do not like the idea of a foreign political structure telling them what they can and cannot do. Troika’s diktat, the people of this Republic can only look on and wait. Prime Minister Cameron’s statement about the “illusion of sovereignty” could have been written about this state apropos Merkel’s Europe. Until the people of the UK exercise their democratic power your nearest neighbours will look on, observing impotently. Afraid I cannot agree to feeling Better Together with England’s Tories. As far apart as possible for me. If they would only take Tory England and float it off across the Atlantic,I would be very happy,which would then allow them to be part of the trading block they really want. Perhaps the Donald will facilitate this after he builds the Mexian wall etc etc. Norway and Sweden manage fine despite having a very long border, and one being in the EU and the other out. We have a contrarian nature in Donegal. We often vote the ‘wrong’ was in referenda and annoy our masters in Brussels and Dublin. A very interesting article and I having family ties to Donegal I agree with everything that the writer said about that county being cut off and starved off investment due to the partition of Ireland. No surprise concerning the DUP position on Europe and I agree again with the writer that some within the Loyalist community continue to hark back to the days of empire and wish for Northern Ireland to be aligned with a Tory England outwith any European influence or control. Theirs is not a future vision of equality where the needs of the many are placed above the needs of the few. I will vote to stay in the European union despite its many flaws, but will not use the phrase “Better Together” for obvious reasons. It’s the same argument for staying in the UK: things could be worse. And like the optimism-starved better together campaign then, this remain campaign will rely heavily on fear. But on a point of information, little Englander is being conflated with imperalism. It’s quite the opposite, in the days of empire it was the little Englanders who thought Britain was enough and there was no need for foreign adventures. I agree on the Project Fear comparison. However, I think that the diminution of Britain on the world stage DOES emotionally hurt some of the UKIPers. The idea of a strong dominant UK on the world stage is a heady brew for the Flag protesting classes in Northern Ireland. UKIPers possibly, but I think the party/Farage are in the little Englander mould, criticising interventions in Ukraine and the middle east. Sinn Fein are probably the closest Irish analogue, and similarly anti-establishment. ‘Throwing up a tariff barrier between Donegal and Tyrone’. Who is proposing such a move ? The most prominent Brexiteer, Nigel Farage, has made it clear he favours continued free trade should Britain withdraw from the EU. I’m fascinated to learn that 75% in Northern Ireland would want to Remain but the DUP and the political representatives might want to Leave. Sounds very dysfunctional if the elected representatives are out of tune with the will of the majority. Possibly your border fears are exaggerated. After all, as has been pointed out, there are few issues with the border between Norway and Sweden and between Switzerland and her neighbours.